Parking was a problem at Seaton Carew when the sun came out for the bank holiday weekend. Mail readers have been reacting to the news that council chiefs could build a new car park at Seaton Carew - and charging drivers to use it. 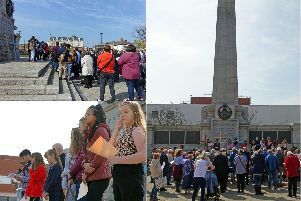 And it's fair to say the move - being considered after scenes of 'absolute chaos' as drivers searched for spaces on the busy seafront last weekend - hasn't gone down well. Debbie Galloway was one of those caught up in the search for a space. She wrote: "Bank holiday weekend I drove round for almost an hour looking for a parking space. I found one near some swings. It said it was a disc zone. "I was told I needed to get a disc to display from arcades then i would get up to 2 hours free parking. I drove off. By the time I got kids out of the car and walked to arcades for a disc then walked back I might of already got a parking ticket." Ian Hayes led the criticism of Hartlepool Council, saying: "Any excuse to get the ticket machine out." Victoria Thomas wrote: "It's been there for so long with free parking all the way along. It's spoiled now by complicated grey rules, and nobody knows whether they are coming or going. "It's a pretty pathetic money-squeezing experiment by the council. I'd rather go to Crimdon or the Headland." Sue Evans said: "Now they have got away with charging, car parks will be popping up all over." Gavin Sanders added: "Brilliant idea, put a car park in that holds 160 cars, that will be empty 99% of the time because we once had a sunny bank holiday." Derek Davison said: "Don't charge people - they spend a load of money in the shops." Dave Mathwin suggested: "Why the owners of Longscar don’t just flatten it and make it a parking area then undercut the council on parking fees is beyond me. "They would make a fortune and it wouldn’t look like such an eyesore on the front." Peter Bradley said: "If hopefully Longscar gets demolished I will bet that becomes a car park as well - anything to make a buck." Not everyone was completely against the idea, however. John Dickinson said: "To be fair it's now £9 to park your car at Whitby for the day and you get a beach, chippy, arcades ... so although its miffing people off having to pay £2 to park, it could be worse... just saying." Ste Buckle agreed: "I’m all for paying to park, only if the money goes towards the area. Will only make sense!"